As noted in the Overview, Erâth is a flat world. The origins of this are a mystery; certainly this does not fit the laws of the Universe in which we live, but it is clear Erâth does not exist in quite the same lifespace. In finite terms, Erâth spans approximately 3,000 leagues in an East-West direction, and slightly more than 2,000 North-South. Most places in Erâth are of temperate climate, with cold winters and warm summers, rainfall and leaf-fall in Spring and Autumn. 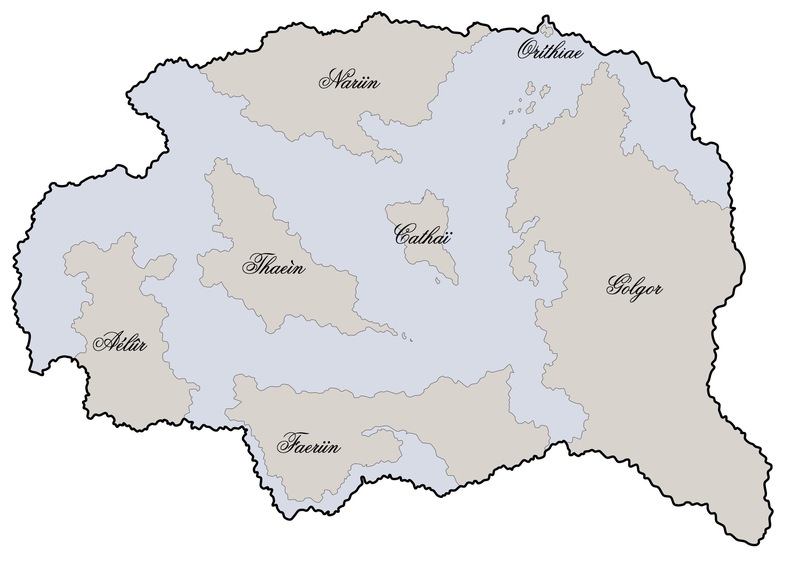 Erâth’s surface is made of six major land masses, with one, large, interconnected sea separating them all. There is also one very small island in the northernmost part of Erâth, no more than 200 leagues East to West, unique in that it does not appear to have originated from any of the larger land masses. These seven land masses form the seven regions of Erâth, and are Golgor, Naruun, Faerün, Cathaï, Thaeìn, Aélûr, and Oríthiae. The names of these lands are one of the few remnants of the Ancients; as long as there have been men in Erâth, so have the seven lands been named. However, they have not always been as they are; the distinct shape of each continent shows that they may at one point have been joined. The movement of these land masses may explain the inability to pass beyond the physical boundaries of Erâth; it is almost as though, in reaching the edge of the world, each landmass has been crushed against itself in ever higher rises of mountains. The easternmost landmass, Golgor, is by far the largest in Erâth. It spans nearly 1,000 leagues from East to West itself, and almost the entire North-South distance of Erâth. Though most of Golgor follows the edge of Erâth itself, the northern part of the continent pulls away to make room for the [Insert Name] Sea. The coast follows a line northwest for most 500 leagues, before jutting suddenly northward again, nearly touching the north edge of Erâth, and almost cutting off the [Insert Name] Sea from the rest of Erâth’s oceans. This marks one of the few spots in Erâth where you can view the edge of the world. In the south, Golgor holds the longest and highest non-edge mountain range in Erâth. The northern continent, Narün is largely uninhabited, and indeed uninhabitable. Marked by hundreds of miles of desolation, little grows and lives here. The northernmost areas are covered in permafrost, and the sun rarely penetrates the darkness of its borders. What few creatures are able to survive in this wasteland are poor to look upon, twisted by darkness into terrible forms. The southern land, Faerün, stretches for two thousand leagues across the edge of Erâth, but rarely borders the edge of the world itself. A narrow channel of water, the Endâren Straight, separates the land from the edge. The western land, Aélûr, is again waste, though not to the extent of Narûn. Black, jagged peaks form its central mountain range, and rise only higher to meet the world’s edge in the South. Aélûr is home to many vagrant civilizations that long ago diverged from men, as well as a multitude of beasts and creatures of darkness. The sea to the west of Aélûr is dark, and poison. This is a place of near permanent darkness, clouded, and lit by flames. Unique to the West remains another reminder of the great feats of the Ancients; nearly three hundred miles separate Aélûr from its nearest land, Thaeìn, yet spanning this unimaginable distance is a bridge of monumental proportions. A mile wide at most parts, it once formed a union between these two lands, and allowed great populations to migrate between them. In the Ages since, the bridge has grown into the earth and sea, and only the great stone pillars plunging hundreds of fathoms into the depths reveal the origins of this construction. Halfway along this passage, however, a small segment has succumbed to the wearing of time, and collapsed in an unknown age into the sea. Thus, nearly half a mile of sea still separates Aélûr and Thaeìn. Thaeìn is the last remaining domain of men, and even here their dominion is failing. The three kingdoms of men dwell here, as do the remaining countries not yet under the fiefdom of either kings of men or lords of darkness. Creatures of dark also dwell in Thaeìn; offshoot cousins of the sicker peoples of Aélûr, they live in mountains and caves, brooding in the darkness. Cathaï, the smallest of the lands (bar Oríthiae), lies between Thaeìn and Golgor. It is one of the only places left in Erâth not overrun by darkness, yet men do not dwell here either. Realm of beasts of natural divining, there is here neither dark nor light, but balance. Were men or any other race to lay claim to this land, it is possible the last bastion of balance would be gone, and Erâth would plunge into unredeemable darkness. Nearly forgotten, in the northernmost seas of Erâth, lies Oríthiae. A small island, Oríthiae represents the oldest place in Erâth. The sun does not set here, nor does it rise. Subdued in eternal twilight, Oríthiae hosts the ruins of the Ancients, a vast, lost city that now gathers dust under the windless sky. It is a lifeless place; not evil, nor good, but screaming silently of the death of an entire civilization in Ages past. The borders of Erâth are unsettling. Where land meets the edge of the world, it climbs to great heights, ending inevitably in a wall so high and so sheer that it is impossible to scale. The peaks skirting these borders can reach upwards of 20,000 feet, decreasing in altitude with distance from the land’s end. If one were to travel through this terrain, the air would become intolerably thin, and yet so laden with moisture, that breathing would become quite impossible. The final impasse of the world’s edge, the towering, unknown heights, disappear into eternal dark clouds, which precipitate in great blizzards of snow upon the high peaks below. By contrast, the places where Erâth’s edges are lined by water, are utterly opposed to the great walls of Erâth. If one were to stand in the ruins of Râthportèn, on the coast of Oríthiae, and look northward to the ending of the world, one would see the vastness of the sea, stretching out on all sides, and abruptly vanishing downwards, into bottomless depths of mist. A vast cataract of unimaginable proportions, the edge of the world plummets to the unknown. In the eastern places of twilight, this view is breathtaking, and echoes the long-forgotten throes of the ending of the First Age, dying in that same fading sun. In the western lands of darkness, this sudden ending of the earth is terrifying. Erâth is a world of many natures; Thaeìn, for example, contains landscapes from snow-crested peaks to low-lying plains, rolling hills and many, many forests. The sea is bordered by cliffs in many places, but there are even beaches to be found here and there. Even in Thaeìn, one of the last refuges of light in Erâth, the touch of darkness is not escaped; the northern part of the land is given over to darkness, and here the landscape is rocky, and barren. The dark creatures that dwell here likely migrated from Aélûr, long ago when the great bridge still joined the two lands. They are kept at bay, and in the north of the land, only by the range of mountains bisecting the continent nearly in two. Some parts of Erâth are less varied; Narün, in the North, is nearly entirely barren, frost-coated wasteland; nothing grows here, and little lives, bar the miserable creatures who exist only to feed on each other. The northernmost parts of this land are impenetrable; gargantuan glaciers and ever-present snow make the land unlivable. Golgor, a mix of waste and desert, contains nonetheless a large, southern land where growing things still thrive; many of these are dark and twisted, however, and those trees that still bear fruit are poison. The seas of Erâth are level; streams run to rivers run to oceans, and many forms of life dwell here. There are even fishing communities dwelling in Thaeìn, but they are wary of the darker things living in the deep. The waters sicken, however, to the East, and the seas off the coast of Aélûr are black, and thick. It can be seen, then, that Erâth is a livable world, in some few remaining places. It once was that the whole of Erâth was dwelt in by men, and in the ruin of Ages the darkness has now all but complete hold over the lands. The cataclysms that brought about the downfall of the First age have indeed left their mark on the surface of the land, and the poison they left behind has sunk deep into the roots of the earth. What is left to men, is habitable, but in only a few, last locations can the darkness of Erâth be entirely forgot.